Ozeri is a brand that I have really gotten to like. Last year, I was able to review some drinking glasses as well as a digital scale which I like both a lot. This time around, I was sent an Ozeri electric wine opener to review. My parents make their own wine so I was interested in trying out this product for them. 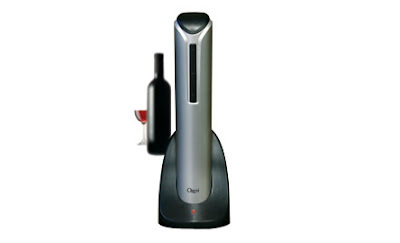 Here is the description of the wine opener: The Ozeri Pro Electric Wine Opener in Rubberized Black makes opening wine bottles easy while entertaining your guests at the same time. Designed for home and restaurant use, its latest generation battery now opens up to 40 wine bottles with the gentle push of a button, all on a single charge. The opener is completely cordless and includes an elegant recharging base with an LED charging indicator. The opener opens both natural and synthetic corks. It also boasts a new ultra light-weight design, a faster motor, and an ergonomic rubberized soft grip for effortless handling. Use it at home or take it with you to impress your hosts and guests before the first sip. What's the verdict? It is great! I have never used an electric wine opener before and it is actually really neat. I do not drink alcohol often but when I do, wine is often my drink of choice. This opener is very handy and quickly opens the bottle without having to work hard getting the cork out like with a manual opener. I think it would be great to use this for a party where you are opening a bunch of bottles of wine. On Amazon, this opener is very affordable and is only $25. 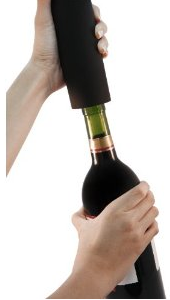 For easy wine bottle opening, check out this electric wine opener. Lucky girl! I'd love to have one of these!!! I have their fridge air purifier and am IN LOVE with it. It does an amazing job for something so much smaller than I expected it to be. If all their products are made as well as that, I will happily be loyal to the brand.